Thanks to Dino_Ranger_White and his amazing sense of searching has led to Walgreens showing the second wave of DBZ figures. Goku was gone at one store I searched, but I'm on the prowl with the other stores later. 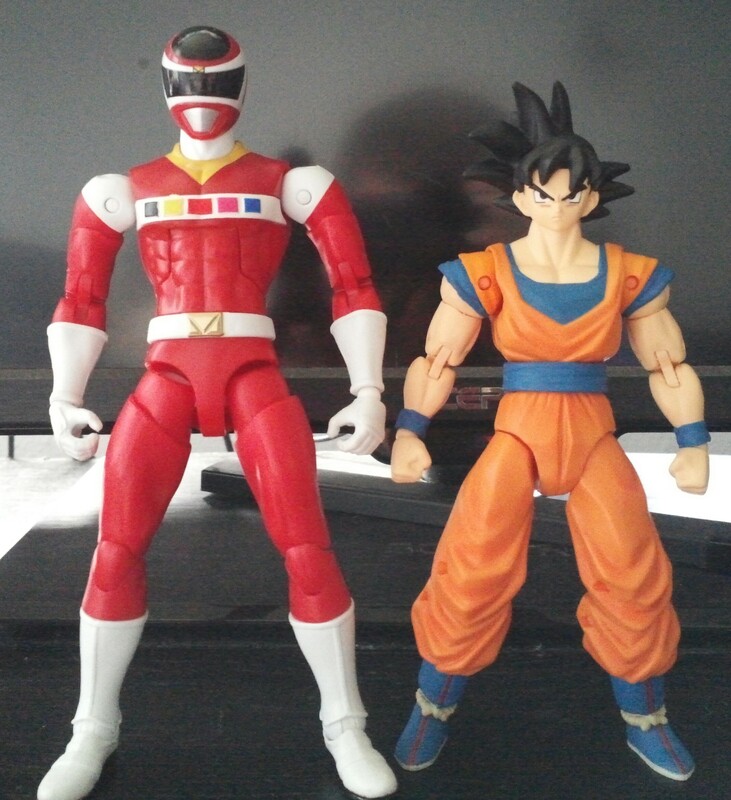 Legacy Rangers -- they are two of the nicest retail figure packages out there. 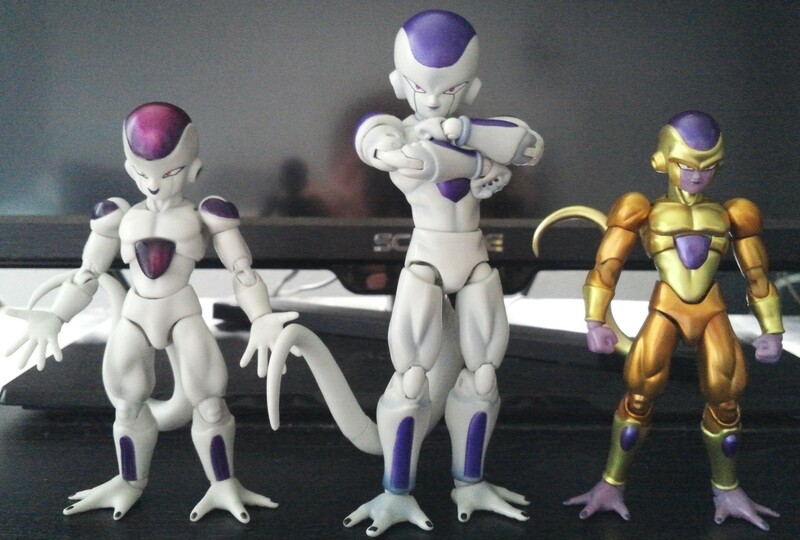 Frieza does look amazing with his metallic purple. What I think is weird, Bandai has blended this weird "Marvel Legends" and "Figuarts" to make these figures. While they aren't perfect, they're light years ahead of the Legacy Rangers. The funny thing too? I prefer these over the Figuarts. Why? Cause I get a bigger figure, BAF, AND I can buy 2 for the price of one. I don't have to get so choosy on which ones I want. moving forward. They need to do a Fat Buu BAF! with the boxes for them… they look awesome hung in a display together. Ohhh boy. I got to start looking for that Frieza now. Really hoping this line continues so down the line we'll be able to get new characters like Hit and Goku Black. But mostly Hit. Visit There D Hood's homepage! Goku'a and Vegeta's base colors are different than they're Super Saiyan forms. They have a totally different color to the clothes, as if they have the aura color reflecting. So yeah, you're buying two of the same figure with a different head, but at least the clothing color is shaded differently so they're not completely identical. And I do agree... SS heads would be the best. But even Figuarts has a difficult time doing that. And face it... it's not like the Saiyan armor and orang gi are THAT different across characters anyway. Ultimate Gohan is just Goku's body with Gohan's head. I understand that the clothes are different and I appreciate they took that step to differentiate the figures, but I'm sure you and others would agree that nobody would've asked for that detail to justify separate figures especially considering the multiple Gokus to come and of course the Gohan that can reuse the body unless they modify the mold for him. Just thinking about it makes it feel redundant. Well, with Dragon Ball the figures have ALWAYS been redundant. I mean, the Super Battle Collection reused the same bodies for certain figures. I mean, Vegetto is literally just painted with black hair on one and yellow on the other. The Ultimate Figure Series is literally nothing but Goku bodies for damn near everyone. Jakks is the worst though. There towards the end they reused so many parts and figures that Trunks ended up with Goku's pants and a painted on belt OVER Goku's sash. 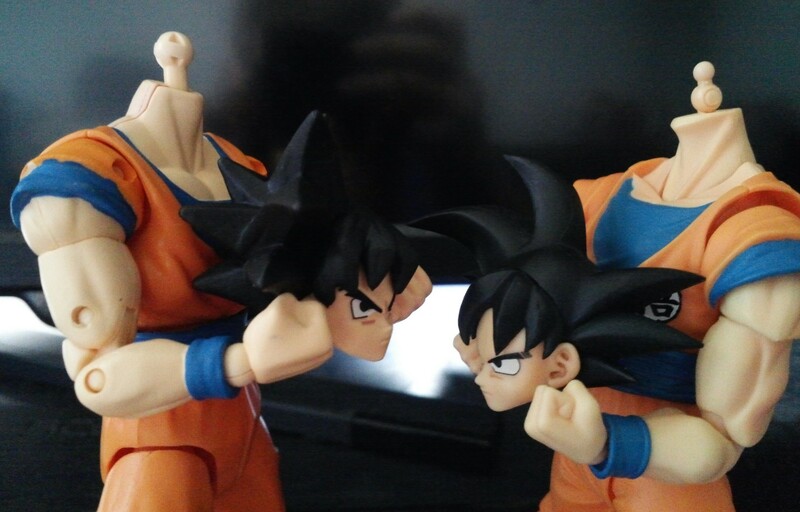 It's just inevitable with Dragon Ball figures. I mean, even the Figuarts have had like 10 Goku bodies and 8 of those are Goku himself... the others are Vegetto and Gohan. And you're paying $40 to $100 a pop for those regular and exclusive releases... that's what hurts. And poor Vegeta can't seem to get a regular head with ANY release... lol! I'm okay with paying $20 for figures, even if I have to buy the same body... BUT that doesn't mean I don't agree with what you said. I do. I also think that since Goku and Vegeta sell... they will push out more individual figures of them, but possibly Trunks and Gohan will have additional heads. I definitely agree and would have liked to have seen a little more diversity in the line to start off with. And I'm not really sure I like the waves split with only 3 figures. 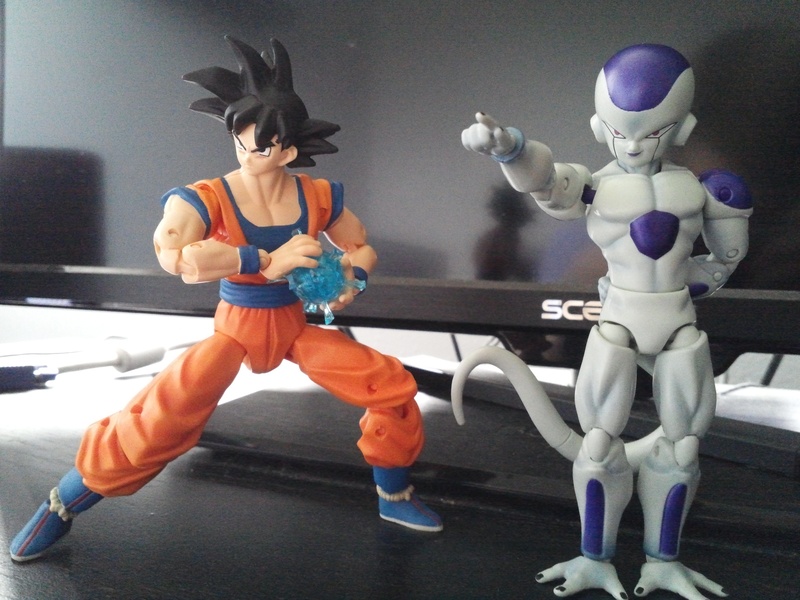 Frieza and SS Vegeta are really cool though! 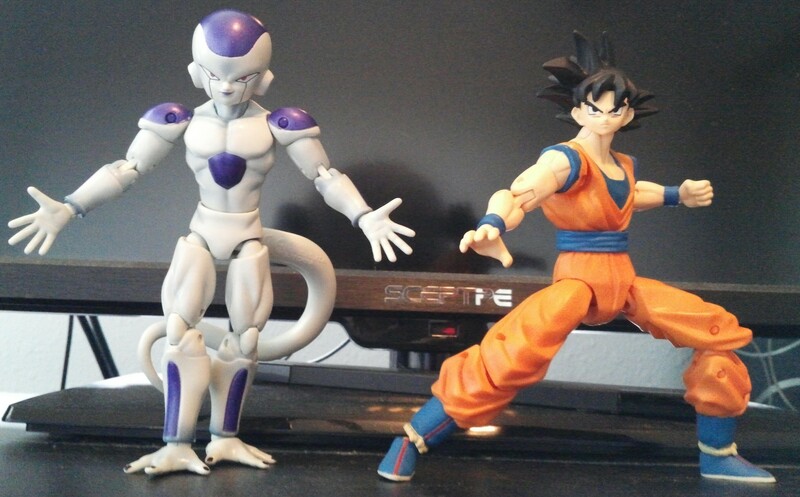 Frieza is a little loose in the legs. Vegeta is a little loose in the torso, but tight everywhere else. Of course I've had some Figuarts that were a little wibbly-wobbly here and there. But I'm really satisfied with these. As someone that has the complete SBC (sans that Movie 3-pack), and has had pretty much the entire Irwin/Jakks line, to Shodo and a few Figuarts... I really do think these are pretty good for what you get. Last edited by Taichi; September 20th, 2017 at 07:17 AM. Let's just agree to agree. I'm aware of the Super Battle Collection figures, but considering it's 2017 and the comparisons to Marvel Legends is inevitable, expecting alternate heads isn't out of left field unless these heads are too big to justify the extra plastic per figure. Like I said, a solo Super Saiyan 3 Goku is the acceptable exception. I'm hoping they're just playing it safe and gauging interest this wave by having two of the figures reuse bodies. I definitely would like to see the line continue. All said, these seem like decent figures for their price point. I hope they do right by Cell Games Gohan, Piccolo, and Future Trunks and give them alternate heads and capes. I don't have any of these yet, but do the heads come off or seem like they're meant to? There's no reason they should but I'm curious. You know... I haven't tried to pull one of the heads off... I can try tonight. I still hate that you found them...but can only hate very small since you helped me so. lol Not sure who i feel about the blue shading on frieza.....wish they would do a NYCC golden frieza version....would make so much sense. I love that we have DBZ items in stores again...i've picked up all the little spit battle people. In their own unique way, they're really cool. Not gonna lie, I've been eyeing those and the Power Up figures of Goku, Vegeta, and Frieza. They remind me a lot of the older DBZ figures from the early-mid 2000's. Which stores are all carrying these? Are they specific to certain stores or will they be getting a mass release? So far I've only seen Wave 1 at GameStop and Super Target, but nothing on Wave 2 yet. I've got to start checking my local Walgreen's now that I know they're getting these too. When I first saw Wave 1 on store shelves I almost died. Unfortunately all the Beerus' I've seen have had missing paint or paint scratches on his dangling belt, so I've had to pass, but I'm really wanting to start collecting this line. The figures are absolutely beautiful! The power up frieza is nice....my only real complaint is that the armor pops off super easy. it's a little too sensitive. Well, that and when the armor is on the figure it looks like he might should have pushed back from the table and eaten a little less. It does not seem like the major retailers jumped on board with the DBS line. distribution has been very limited so far. In PA, Gamestop was Wave 1 and Walgreens is Wave 2. Those were the only places to get the figures. Toys R Us actually have them. That's where the majority of the items are. You might be able to pick them up at a Books A Million or Barnes and Noble. But TRU actually have the figures, along with the Scouter and the small figures. Good to know. Thanks for the replies, guys! After checking this topic out yesterday I drove to my local Toys "R" Us and they have Super Saiyan Goku and Vegeta from Wave 1. Out of the four Walgreen's I checked I saw three Frieza's, a Super Saiyan Vegeta and a Goku from Wave 2. It looks like people are eating up the Beerus' around here and who can blame them? 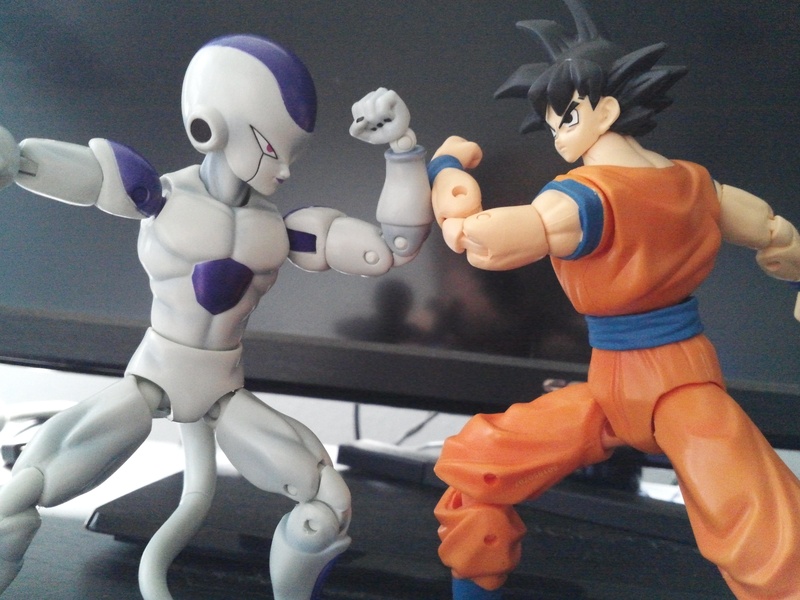 If funds were limited and I could only choose a couple of figures it'd be Beerus and Frieza, no contest. Had the opposite problem as Taichi, went to Walgreen's and got Frieezie pop and normal Goku, no Super Saiyan Vegeta. Anyway, I took a few pictures to hopefully answer some questions about these guys. These really are cool figures, very sturdy, and great if you're looking for near figuarts articulation on a budget. Now onto what most people are probably wondering about, size comparisons! On the left is the Figure Rise model kit and on the right is the Figuarts. 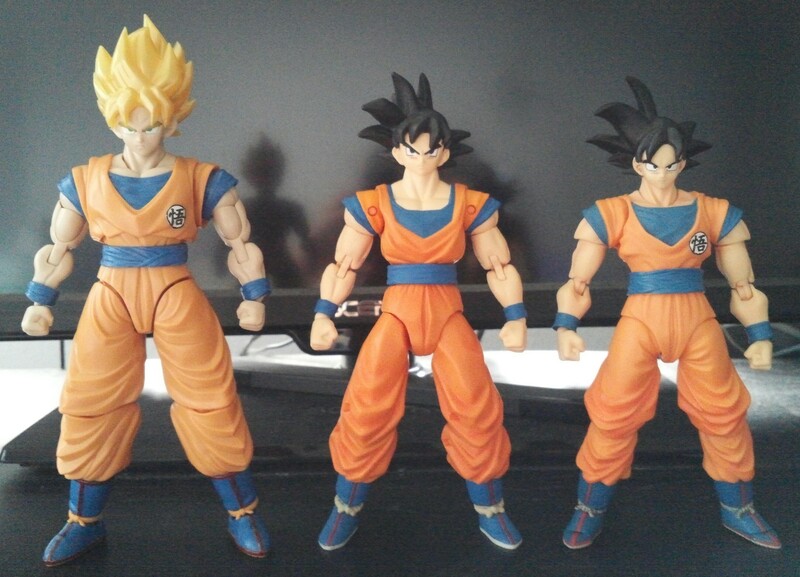 The Dragon Stars Goku is just a hair taller than the Figuarts, if you posed them you probably couldn't even tell. Freeza is another story though, much bigger then either of his Figuarts counterparts, but thankfully he's still shorter than Goku. His head is seriously massive though. 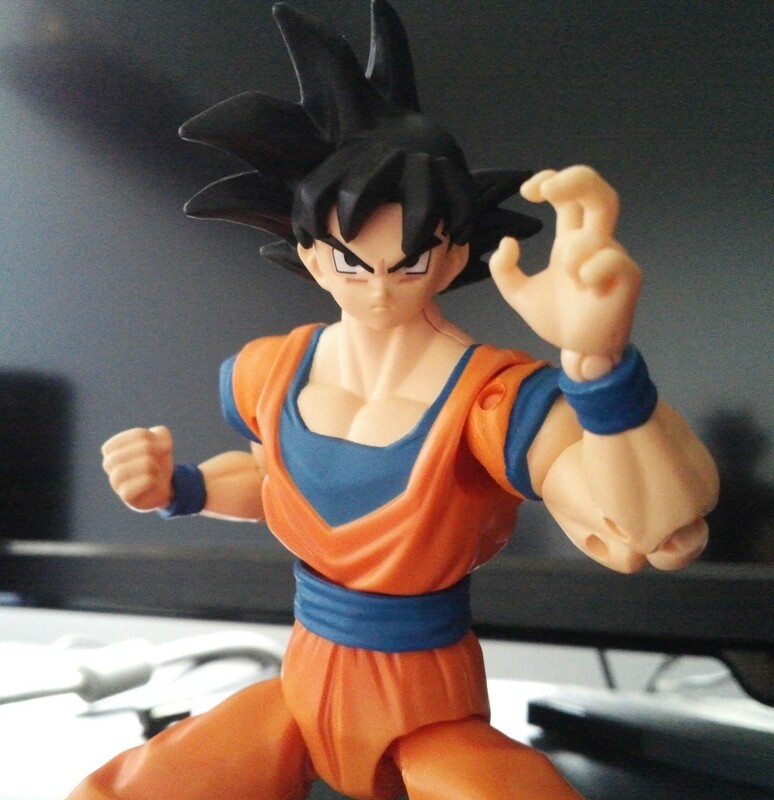 Last thing, you can pop off Goku's head, and from what I've seen you should be able to swap the Super Saiyan head onto the normal body, if you prefer those colors. However, if you wanted to swap heads with a figuarts, you're out of luck, the peg sizes are way different. Same goes for the figure rise, but nobody (except me) cared about that. 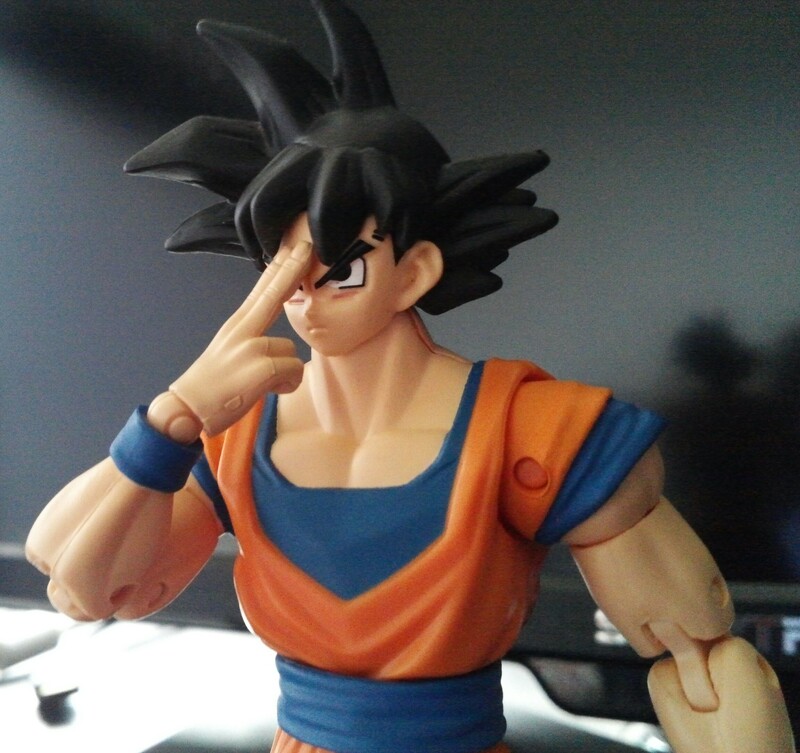 Goku's neck peg is annoying though, it's angled so you can't get any downward movement, and only a little bit backwards. I would have preferred something more akin to the Legacy figures neck joint, if they were going to make the ball joint this weird. Overall though, I definitely recommend these, they're some cool Dragon Ball figures, for a fraction of Figuarts prices, and that sounds pretty good to me! Last edited by TheSentaiGuy; September 21st, 2017 at 08:44 PM. Part of me is relieved that Super Saiyan Goku and regular don't have different hand combinations so I wouldn't have to buy both. The other part wishes they did. The fighting stance ones, Instant Transmission, and Big Bang Attack hands would've been great. Now I'm wondering how good the Goku looks charging a Kamehameha right before he hit Cell with it and his pose for the Father-Son Kamehameha.